GeneaWebinars: Legacy Tree LIVE: Your Southern U.S. Genealogy Questions, Answered! 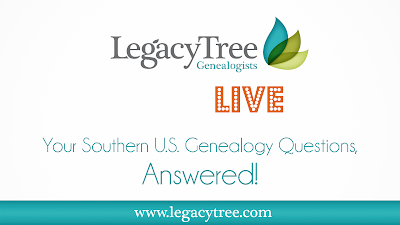 Legacy Tree LIVE: Your Southern U.S. Genealogy Questions, Answered! October is Family History Month in the U.S. To celebrate, we’re hosting a special “Legacy Tree Live” broadcast, where one of our genealogists will be answering YOUR questions on Southern U.S genealogy research. Have a question regarding genealogy research in the Southern U.S.? You’re not alone! This area can be notoriously difficult to research! Submit your Southern U.S. genealogy questions using the form below, then tune in to the scheduled LIVE broadcast on our Facebook page for answers on Wednesday, October 25th at 9 a.m. MST. Labels: #familyhistory, #genealogy, #legacytree, #southernU.S.